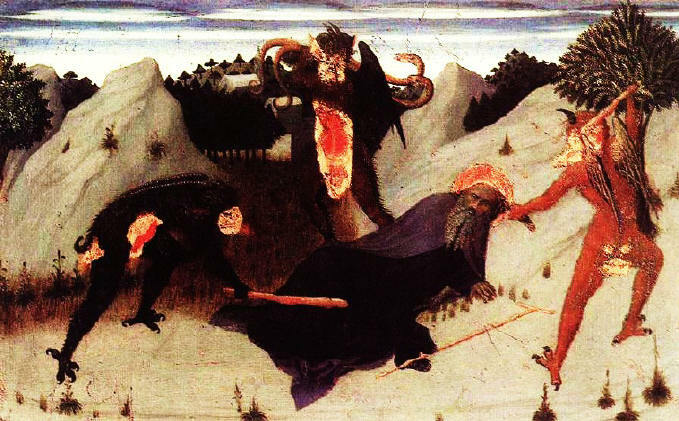 Sassetta's paintings were heavily influenced by the teachings of Sienese mystics. As a landscape painter he moves along the most primitive lines. Backgrounds are composed of peculiarly jagged and bare cliffs, here and there a tree or plant sprouts. The picturesque fundamentals of the landscape, streams, valleys, hills, and woods are fanciful and quirky. The figures are not naturalistic in detail but more decorative in form. The beauty of a Sassetta painting lies in the great flow of line, the clear arrangements of groups, and the strict subordination of most detail. In order that the clearness of presentation might not suffer, he avoids all accessory figures, confining himself to a laconic expression of the spiritual content of his theme. While Byzantine art is severe and rigid, Sienese painting possesses a mystic syncerity. . It seems as if the stone vaults of the churches had suddenly become transparent, and the eyes gazed upwards towards heaven, where tender ethereal beings, singing and praising the Highest, lived in eternal youth and lovingly gazed down upon mankind. In his great Madonna of the Cathedral, Duccio gave first impulse. This Mary is no linger sever and dignified, but mild and gracious, as if she has had pity upon the longing soul of the believer; for a soft dreamy melancholy transfigures her features. Her relation to the Child also is changed; she is no longer the involuntary mother of God, but a tender mother. Duccio explored in his own art a new world of emotion and passion, but with a lyricism and sensitivity to color that became the foundation of Sienese painting.